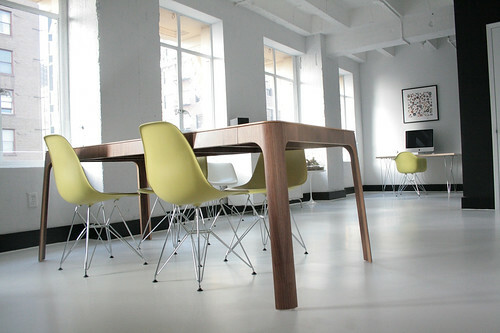 Bright, modern office: Orange paint + chocolate-brown accents, originally uploaded by xJavierx. Can't commit to a bright orange box? Try painting one wall a paler tone and keeping the others neutral. Add dark wood furniture and chocolate-brown accessories for sophisticated contrast. 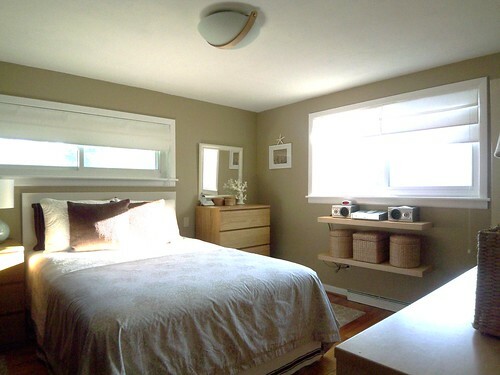 Or go the opposite route -- bright white and pops of turquoise would look great in this space, too. Desk from Dwell; paint from Fired Earth; carpet from Brintons. Pretty pink kitchen via LivingEtc, originally uploaded by Lyndar T. Merciless. weinstein-loft-living-room, originally uploaded by plastolux. Loft living room with some furniture. 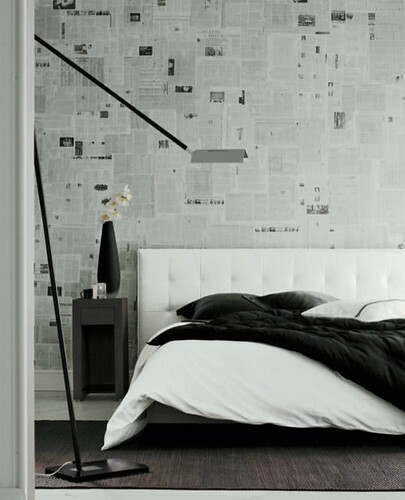 Wallpaper ideas: Newspaper + black + white bedroom, originally uploaded by xJavierx. , originally uploaded by M. Dash. 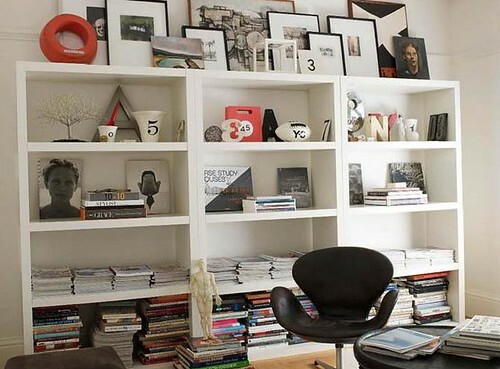 Modern office: Vintage Jacobsen Swan chair + IKEA bookshelves, originally uploaded by xJavierx. I know you're absolutely swamped with work, Aaron darling, so I won't disturb you. Just sit in your vintage Arne Jacobsen Swan chair with its original leather and I'll bring you your hot cocoa in an hour. 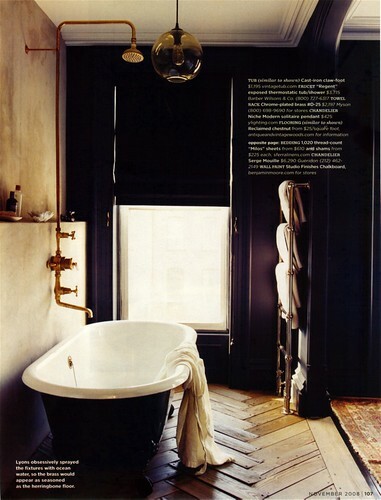 Photo by Julian Wass, House Beautiful, Oct. 2009. Black, white, modern: Sleek library featured in Met Home, originally uploaded by xJavierx. 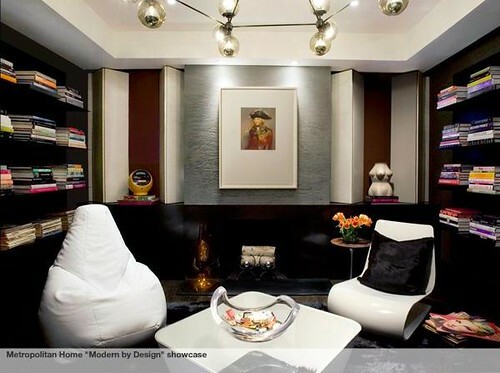 A 'gentleman's library' designed by Nicole Hollis and featured in Metropolitan Home's 2009 San Francisco showhouse. 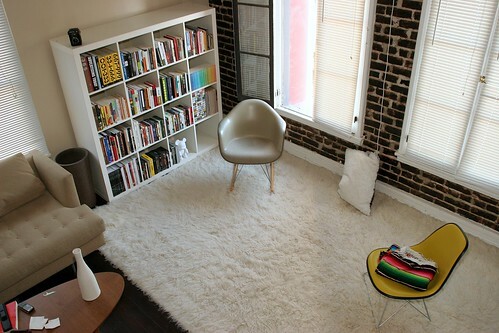 The white beanbag chair is from Zanotta. Christophe Pillet designed the Nouvelle Vague (ha) thermoplastic lounge chair for Porro. The Modo chandelier, constructed of smoked-glass globes and aluminum spokes, is by Jason Miller. Benjamin Moore 'Van Deusen Blue': Elegant, colorful farmhouse by Jeffrey Bilhuber, originally uploaded by xJavierx. 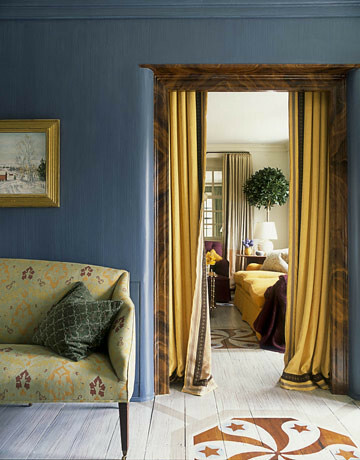 For the entrance hall of a Pennsylvania farmhouse, designer Jeffrey Bilhuber chose a regal blue (Benjamin Moore's Van Deusen Blue), which he based on a color he had seen at Mount Vernon. A 1920s settee is covered in Le Gracieux’s hand-blocked 'Kirachi' damask. Photo by Julian Wass, House Beautiful. Turquoise blue + white bedroom from Elle Decor, originally uploaded by xJavierx. 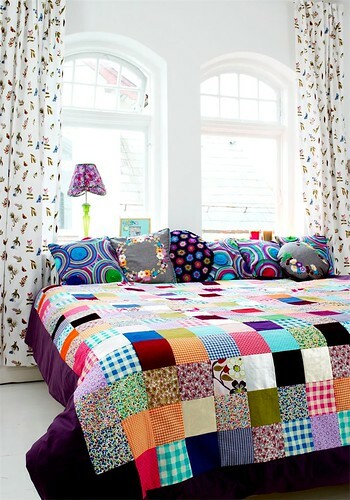 Photo by William Waldron, Elle Decor, Sept. 2009.
room, originally uploaded by plastolux. low sofas , originally uploaded by ooh_food. geometric window treatment, originally uploaded by ooh_food. 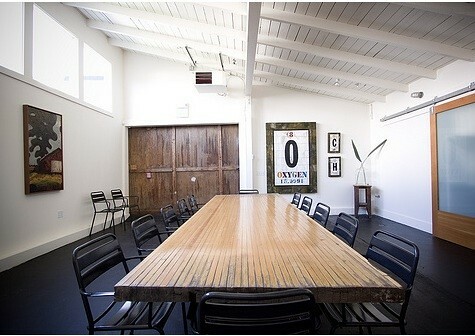 Design Glut workspace , originally uploaded by ooh_food. red and green bedroom, originally uploaded by ooh_food. 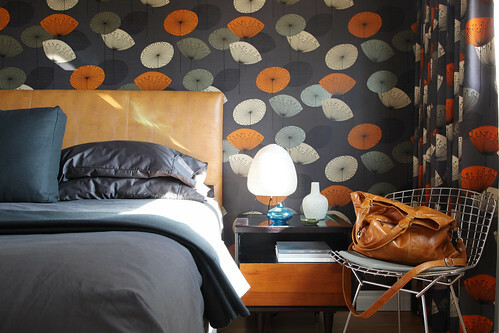 high contrast in one bedroom. modern + farmhouse combo Justin Patrick, originally uploaded by ooh_food. living space with red color. jenna lyon, originally uploaded by plastolux. baby room with some contrast color. open space white tone makes room clean and look bigger than actual space. rearranged the living room, originally uploaded by yardsale01. Spring's here. I like to read by the window, a nice 5th floor breeze. Bedroom firelace white, originally uploaded by jodymeza. Domino Nov 08.jpg, originally uploaded by Tammy Manet. oska_081208_02, originally uploaded by Isabelle et Julien. Large space loft style living room. 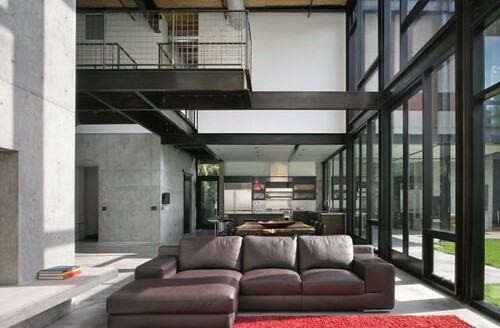 The loft shown the real material surface and structure which reflexing the industrial age. FIND PEACE IN YOUR OWN OASIS, originally uploaded by Gustavsberg. Large white tiles on the walls, luxurious white towels, white jars and white details everywhere. The floor mosaic provides an interesting contrast, with an irregular, lively pattern that you will never tire of looking at. Our pattern here is our own design, but most tile manufacturers provide ready-made patterns that are simple to lay. awesome industrial kitchen, originally uploaded by ooh_food. sunny sunday, originally uploaded by xojy. daybed, originally uploaded by ooh_food. Eichlers in the San Mateo Highlands, originally uploaded by thomasfj. Bedroom, originally uploaded by supershoppertoo. tres jolie damas or bathroom, originally uploaded by Lea Ceramiche. 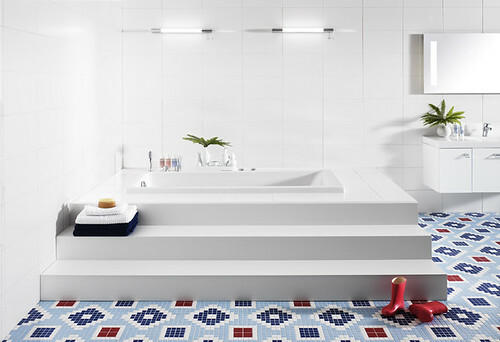 Lea Ceramiche Bathroom tiles create a timeless atmosphere capable, thanks to a vast choice, that matches anyone’s personality. 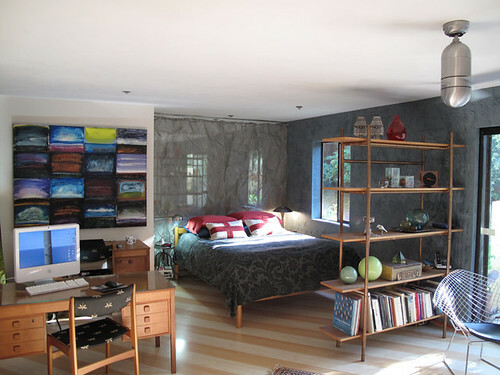 High design surfaces, make these environments suggestive and refined. rice aw09 , originally uploaded by frillie designs. 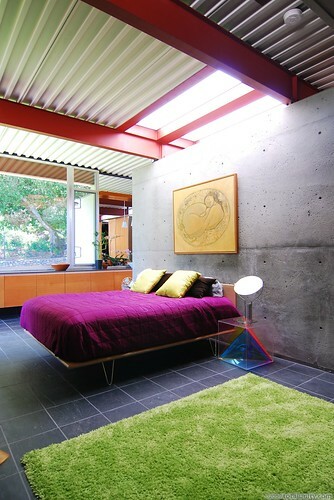 Dandelion clocks mid-century bedroom design, originally uploaded by The 10 cent designer. A recently completed project. In the same small Ranch style home as this . I used the Sanderson wall paper & the beautiful fabric for draperies. The headboard is my design and is made of "faux" Lizard. Indoor slide via Apartment Therapy, originally uploaded by Lyndar T. Merciless. it's a dream toy for every kid.